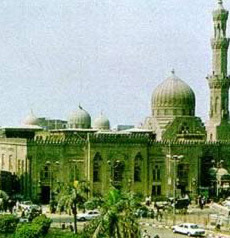 The patron saint of Cairo is Sayyida Zeinab, granddaughter of the Prophet Mohammed (daughter of Aly Ibn Abu Taleb), and her mosque which houses her shrine is located in the As-Sayyida Zeinab Mosque built originally about the time of the Hussein Mosque. It was renovated in 1549, rebuilt again in 1761 and completely rebuilt again in 1884 and 1942. The main facade, minaret and cupola are typical of the Mameluke style. The interior is finely decorated with arabesque and inscriptions. It contains a colonnaded prayer hall with a painted wood ceiling and cupola in front of the mihrab. The western mausoleum is topped by a cupola also, supported by a pendentive of stalactites, and the cenotaph is enclosed within a finely worked bronze grille. It should be noted that this is a very popular place of pilgrimage for Muslims.